Attaché My Pay has very successfully launched with over 50,000 registrations. This app gives your employees mobile access to their payroll documents via their own ‘inbox’. If employees sign up with personal email addresses and move to another company utilising Alex Pay Slips, they keep their pay slips and payment summary history! Currently, when Alex Pay Slips are sent out, there is a message in the email that employees receive detailing how to register for My Pay. Attaché My Pay is the beginning of integrated web apps in development. Ability for staff to update Master File information. Go to https://profile.attacheonline.com/SignIn?service=mp&ReturnUrl=%2F to Sign in or Register. 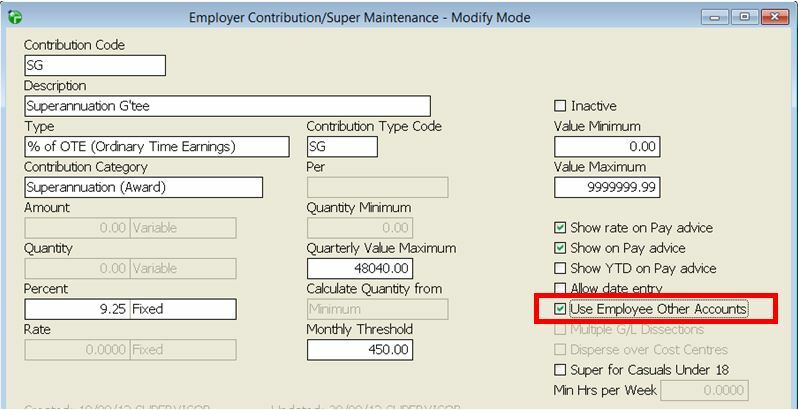 To make sure all relevant contributions (and deductions) are captured for SuperStream, go to Setups / Payroll – select the relevant code and check that “Use Employee Other Accounts” is ticked. Click Super is our preferred method of for SuperStream – simply because it is so easy! Yes, it has a transactional cost of 50c per employee per transaction, but once setup the time saving can be huge. As an example: a payroll of 30 employees, 11 different funds, paying superannuation monthly would cost $15.00. Without ClickSuper, this took 2 hours and payroll lady who completed this is paid $32.00 / hour. A saving of $49.00, couldn’t this time be better spent? Click to read through SuperStream, What Is Your Solution?